First, choose some of the twigs your husband just pruned off of the tree. Or beg your neighbor for their twigs. and pretend you see rocks. Give your branches a good coat of spray paint. Let dry, repeat. Meanwhile, gather enough rocks to fill your pot. I'm using very little Plaster of Paris so I need more rocks. Typically you want about 2 inches at the top for the P of P. Stick your (now dried) branches in the rocks just like you want them. Now mix up your Plaster of Paris. Two parts P of P to one part cold water. I mixed mine in an old ice cream tub with a stick. Use things you can easily rinse or throw away. For this project I used 2 cups P of P and one cup water. 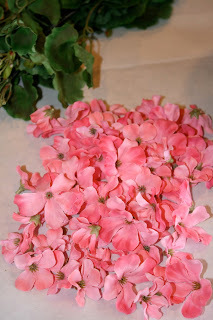 Cut your flowers so they have a very little stem. 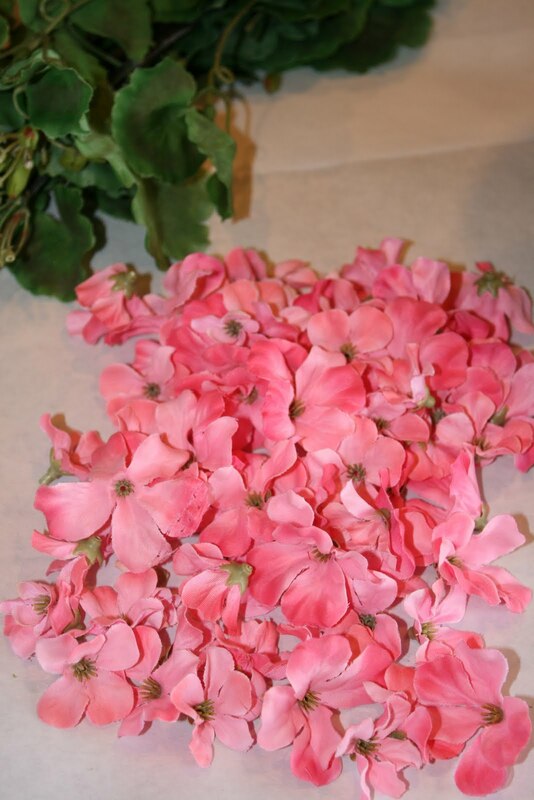 Until you get a little pile of cut flowers. These flowers were not $9.99. I used my 50% off coupon at Hobby Lobby. Cha-ching. Now get your moss (this is reindeer moss). I liked this moss because it was light green. Put it around the base of your tree. Looks better don't you think? 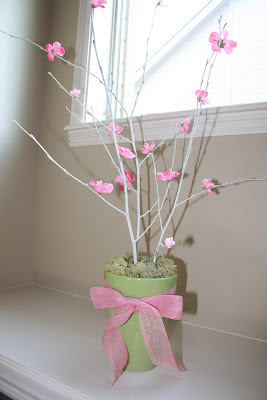 Now hot glue the flowers on the branches and tie a bow around your pot. These centerpieces will be perfect for the party. Try this project for your next event...go on, you can do it! You're back! Thanks for your comments.